You will find below the horoscope of Rihanna with her interactive chart, an excerpt of her astrological portrait and her planetary dominants. Horoscopes having the same aspect Moon square Midheaven (orb 0°27'): Albert Einstein, Katy Perry, Vincent van Gogh, Jessica Alba, Marilyn Manson, Kate Winslet, Alain Delon, Catherine Deneuve, Muhammad Ali, Jean-Luc Mélenchon, Lucy Lawless, Rocco Siffredi... Find all the celebrities having this aspect. Horoscopes having the same aspect Sun sextile Saturn (orb 0°34'): Meryl Streep, Robin Williams, Robert De Niro, Kat Bjelland, Winston Churchill, Yasmine Bleeth, Janet Jackson, Claude François, Meg Ryan, Amy Lee, Benito Mussolini, John Wayne Gacy... Find all the celebrities having this aspect. Celebrities born the same day: Kurt Cobain, Cindy Crawford, Ivana Trump, Ophélie Winter, Julia Volkova, Charles Barkley, Sidney Poitier, Trevor Noah, Laure Guibert, Pierre Boulle, Gordon Brown, Carlos (singer)... List of all the celebrities born on February 20. Celebrities being the same height: Adolf Hitler, Katy Perry, Emmanuel Macron, Kanye West, Eminem, Catherine Zeta-Jones, Mariah Carey, Sophie Marceau, Whitney Houston, Robin Williams, Salman Khan, Shahrukh Khan... List of all the celebrities being 5' 8" tall. Celebrities clicked on in real-time: 576,844,630 times. Rihanna (pronounced /riːˈɑːnə/, born Robyn Rihanna Fenty on February 20, 1988 (birth time source: Imdb http://www.imdb.com/name/nm1982597/bio.ref_=nm_ov_bio_sm "Born on a Saturday at 8:50 AM. ")), is a Barbadian singer. She also serves as the cultural ambassador for Barbados. She is the first Barbadian artist to win a Grammy Award.a Rihanna is currently signed to the Def Jam Recordings label. She has attained five Billboard Hot 100 number ones thus far ("SOS", "Umbrella", "Take a Bow", "Disturbia" and T.I. 's "Live Your Life"). Rihanna broke into the recording industry in 2005 with the release of her debut album, Music of the Sun, which features the hit single "Pon de Replay". Here are some character traits from Rihanna's birth chart. This description is far from being comprehensive but it can shed light on his/her personality, which is still interesting for professional astrologers or astrology lovers. 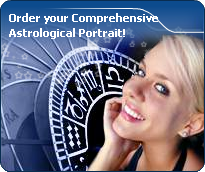 In a matter of minutes, you can get at your email address your astrological portrait (approximately 32 pages), a much more comprehensive report than this portrait of Rihanna. Rihanna, the diurnal South-western quadrant, consisting of the 7th, 8th and 9th houses, prevails in your chart: this sector brings about a thirst for communication and sometimes, a need to take risks in your dealings with others. Relations are a factor of your evolution and your transformation, which you accept serenely. Indeed, what matters to you is the movement and the energy that link you to others and that make you gain more awareness. A kind of rebellion or a desire to get away from it all is rooted in you. Rihanna, Fire is dominant in your natal chart and endows you with intuition, energy, courage, self-confidence, and enthusiasm! You are inclined to be passionate, you assert your willpower, you move forward, and come hell or high water, you achieve your dreams and your goals. The relative weakness of this element is the difficulty to step back or a kind of boldness that may prompt you to do foolish things. Like the majority of Earth signs, Rihanna, you are efficient, concrete and not too emotional. What matters to you is what you see: you judge the tree by its fruits. Your ideas keep changing, words disappear, but actions and their consequences are visible and remain. Express your sensitivity, even if it means revealing your vulnerability. Emotions, energy and communication must not be neglected; concrete action is meaningless if it is not justified by your heart, your intellect or your enthusiasm. Rihanna, the Cardinal mode is dominant here and indicates a predisposition to action, and more exactly, to impulsion and to undertake: you are very keen to implement the plans you have in mind, to get things going and to create them. This is the most important aspect that inspires enthusiasm and adrenalin in you, without which you can grow weary rapidly. You are individualistic (maybe too much?) and assertive. You let others strengthen and improve the constructions which you built with fervour. Cadent houses, namely the 3rd, 6th, 9th and 12th houses, are very emphasized in your chart, Rihanna. They indicate important potential for communication, adaptability and flexibility. These houses are symbolically linked to the mind and intellect. The relative weakness implied by these characteristics indicates your tendency to hesitate or to be indecisive, but also your remarkable ability to start off again, which is a nice quality, finally: you can easily get yourself out of a tight spot thanks to your mobility and casualness, in the best sense of the term. This group of houses corresponds to evolutionary characteristics of your personality. However, they are only indications and you must include them in the rest of your chart in order to see whether they are validated or not! In your natal chart, the three most important signs - according to criteria mentioned above - are in decreasing order of strength Aries, Capricorn and Sagittarius. In general, these signs are important because your Ascendant or your Sun is located there. But this is not always the case: there may be a cluster of planets, or a planet may be near an angle other than the Midheaven or Ascendant. It may also be because two or three planets are considered to be very active because they form numerous aspects from these signs. After this paragraph about dominant planets, of Rihanna, here are the character traits that you must read more carefully than the previous texts since they are very specific: the texts about dominant planets only give background information about the personality and remain quite general: they emphasize or, on the contrary, mitigate different particularities or facets of a personality. A human being is a complex whole and only bodies of texts can attempt to successfully figure out all the finer points. You are a “free-thinker”, Rihanna, and you tackle problems with a swift and efficient mind. Freedom, progress and originality are your driving forces. You are resolutely future-oriented and with ingenuity and inventiveness, you reform what is outgrown and you constantly innovate: psychology, computer sciences, new technologies... have almost no secret for you. Your human and idealist qualities are obvious, you are a very pleasant and interesting interlocutor, even though your rebellious and revolutionary side may be criticized. Indeed, you seem to be driven by a strong argumentativeness: you seldom share your friends' views and, although you may come across as obstinate, intransigent and unpleasant, you do not hesitate to speak the truth! Instead of causing sudden break-ups with your friends, it is advisable that you express your creative potential more persistently whenever your nervous tension is too high. Love at first sight, flash in the pan, amorous impulsiveness? All these are part of your way of loving or to fall in love, Rihanna. Throughout your relationship, you maintain this kind of jerky and lively style, that may seem childish or naïve, but that is so generous and cheerful! You are undeniably possessive and you are not concerned with your partner's opinion but, fortunately, you readily forgive because of your spontaneity and your authenticity. When your relationship is intense, everything is fine. There is no romanticism, no complications with you. You love with ardour and, except for a few crazes and opportunities for new pastures here and there, the only danger may be that boredom settles in. In that case, you leave without regret and you quickly forget what consumed you, not so long ago. The ruler of the Ascendant, Rihanna, is Mars. It is posited in the sign of Sagittarius and gives you a strong inclination for the open sea and for freedom. Loyal and benevolent, you put things into perspective, and you understand the true value of things, perhaps precisely because you travel - whether actually or mentally - and that stepping back from your intimate environment enables you to better perceive what is important and worthy. Rihanna, you are a real Goliath and you often excel in sport; your thirst for conquests prompts you to constantly launch new challenges. The enthusiasm you put in your undertakings is perfectly well supported by your moral concepts and an idealism compatible with the values of the society you live in. You are pragmatic, enterprising and sometimes, naive. You do not pay attention to details and you launch various great adventurous projects that are all doomed to success. In a few rare cases, you can funnel your huge energy into more philosophical, even spiritual or religious enterprises, where your entire fieriness works wonders. On the sexual plane, your ardour and your spontaneity are your main assets. The danger is that you may spread yourself too thin in the sense that you may forget about faithfulness, particularly during the extensive faraway travels you are so fond of. This text is only an excerpt from of Rihanna's portrait. We hope that it will arouse your curiosity, and that it will prompt you to deepen your knowledge of astrology, as well as to visit and use the wide range of free applications at www.astrotheme.com.